I used to say that the only good Indian, in modern America’s mind, was a dancing Indian. Tourists, scholars, artists, and fairgoers all seemed to like Indians best when we were dressed to the hilt in feathers, beads, and war paint. When we danced, we were safe to consume. Unless we conformed to the stereotypes, most Americans did not want to hear from us. 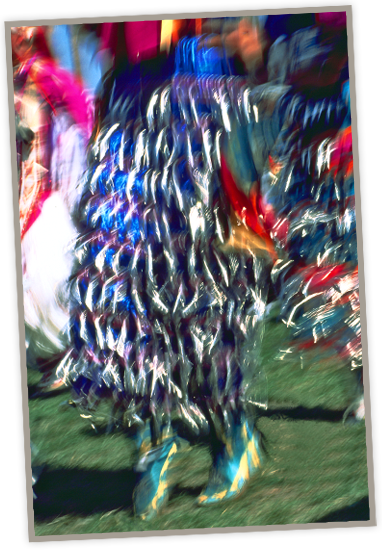 In this way of thinking, the powwow became a sort of Indian minstrel show in my mind, where Indians fiercely competed for prize money—to the delight of the non-Indian audience. I almost came to resent the powwow as the ultimate insult to our real dancing culture. But the power of the drum is just too much for me to resist, as it is with most Indians. No matter how far away I am when the drum starts its call and the singers crank up a good song, the powwow becomes an irresistible magnet, pulling me and hundreds of other people to it. The dance circle draws us in. The powwow has now spread coast to coast, and while some see it as a pan-Indian fabrication, I now see that it serves as a vital catalyst for cultural renewal. What makes this so? Certainly, the idea that Indians have been gathering to dance for longer than there has been a thing called the United States, makes the tradition of dance a powerful metaphor for expressing ancient beliefs that transcend modern realities. But this is not just about reliving the past. Each generation of Indians has to learn the songs for themselves, learn the traditions of their dances, learn how to make their own dance outfits, and, of course, learn how to dance in their own way. No matter how we dance, how we dress, or how we live, for the few moments of the song we stand together as a people, united by tradition and connected in the certain belief that dance is essential to the expression of ourselves. Be it a time-honored song or a new creation by the hottest drum, the act of dancing makes the powwow come alive. Powwow is not a spectator sport, despite the crowds that gather to watch Indian dancers. Powwow is for everyone, young and old, men and women, East and West, to share our sense of ourselves. We have all heard that the drum is the heartbeat of the earth, that dancers move their feet in harmony with that heartbeat. We have all heard of the meaning of the dances, the symbolism of the clothing, and the sacredness of the feathers. But the real meaning of the dance cannot be explained. Magic happens when individuals take the time to make the beadwork and bustles, learn the songs and steps, and proudly step forward to express themselves through these dances. It is that magic that keeps me coming to the powwow, like sunlight that shines into dark woods as one pushes through to a clearing. The light makes the woods come alive. The quality of that light can only be enjoyed by being there. The powwow has become our light in a very dark world. These photographs are a testimony to those individuals who make the powwow magic. They are the human element behind the traditions, the real people who keep it all going. They may be construction workers, computer operators, students, or blackjack dealers during the week. On weekends, however, the ageless drum calls again, not to help them relive their cultural past but to celebrate their real existence in the world. It is the dancers’ faces in these photographs that speak to me the loudest, despite their very quiet demeanor. They tell me of themselves, determined and honor-bound to keep the dancing tradition alive. It is more than pride that I see. It is a faith in what their ancestors have given them, and it is also a faith that somehow the Creator will see them as they dance, not for the prize money but for the sake of the dance itself. For the powwow is a communal expression of belief that is shared by hundreds of individuals who gather from across the country to celebrate their uniqueness as the native people of this land. I am very grateful for that, and hope that you think of these thoughts as you look into the faces of these people.